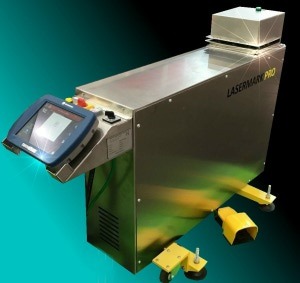 LASERMARK-PRO V4 mobile laser marking on glass. The high powered solution for perfect glass marking, no consumable inks or templates. Up to 999 free-programmable logos and formats. Crisp and clear marking in seconds, including logos, trade marks, dates and times, running numbers, specific sorting or routing codes. Operable for left and right, vertical and horizontal applications, height adjustable and mobile for use in multiple locations around the factory.